M&A is ultimately a shortcut to growth. But not all firms have the same idea about how to achieve that growth and, therefore, what acquisitions to make. From our research, however, we expect technology to be a motivating factor in future dealmaking. For instance, more than half (58%) of fast-growing companies report that the acquisition of IP or new technologies is already one of the most important ways that past M&A has contributed to their growth. Moreover, this rises to almost three-quarters (70%) who expect to realise such benefits from M&A over the next three years. If the ability to innovate and reinvent is a crucial distinguishing characteristic of fast-growing businesses in the financial services sector, M&A provides a means to achieve that innovation, and quickly. Looking ahead, conventional expansion will remain a prime objective. Almost half of businesses (46%) expect transactions that increase their market share to be the main way in which M&A helps them to grow, while 26% and 22% respectively cite a desire to move into new product lines or new geographies. However, M&A does not come without its risks and challenges. 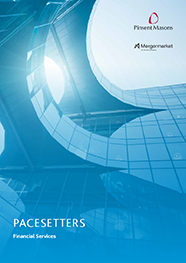 For 39% of fast-growing financial services businesses, legal or regulatory issues have been the most critical barriers to M&A over the past three years. This is followed by 37% who cite the difficulty of agreeing on a valuation, which might be expected given the full prices that vendors have demanded in recent times. External factors play their part too. More than one-third (36%) of fast-growing financial services companies report that an unstable political environment has been a key strategic barrier to dealmaking, and almost a quarter (23%) feel that economic volatility has proved problematic. Overcoming these hurdles is part of the challenge of pursuing strategic M&A. Once a deal has successfully completed, however, the successful integration of acquisitions will determine whether the deal creates or destroys value. Many businesses will need to do more work on integration planning – and at an earlier stage – to give their deals the best possible chance of success.